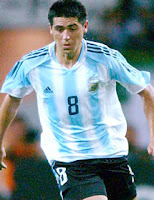 First off, Juan Riquelme's agent Marcos Franchi has confirmed that Tottenham Hotspur have lodged a bid for the Argentine. Sky Sports report that Spurs have offered £10million for the playmaker, with Franchi describing their offer as the only 'serious negotiations' for the player. Middlesbrough have made a £6.5million offer for Afonso Alves of Heerenveen, according to The Times. Finally, it seems the deal to take Cicinho to AS Roma is now off. Marca (Spanish link) report that Real Madrid have ended negotiations after manager Bernd Schuster decided that the Brazilian fullback does now enter into his plans for next season.